In order to learn French efficiently, you need to understand the French grammar terms used by books and French teachers. This is particularly true for French verbs, since understanding the logic of French verbs is complicated enough for students. If you can’t understand the explanations, then you are in real trouble. Often though, it’s not the French verb logic which is difficult, but the French vocabulary used to explain it which you simply don’t understand. What follows is a quick overview and recap of what these different French grammar terms mean: all these concepts are clearly and progressively explained in my audiobook French learning method À Moi Paris. What is an Agreement in French Grammar? In French, some words are said to “agree” with each other. The same way as in English you will add an “s” to the 3rd person singular (she singS). In French, you will have to change some words or parts of words (like the endings of verbs or French adjectives) to match other French words related them. A verb indicates an action. or a condition (to be, to have). A pronoun replaces one or several nouns. When you speak of John, instead of repeating his name over and over, you use the pronoun “he”. “Him”, “his” are other kinds of pronouns, although they also refer to Paul. You will choose the correct pronoun according to the grammatical value of the noun you wish to replace. For example: “he” is used to replace a noun subject of the verb, “him” for an object pronoun and “his” for a possessive pronoun. French pronouns tend to be complicated for English students, because students often don’t really “understand” pronouns in English. I’ve written a free blog lesson about French pronouns which I invite you to read for more info. French pronouns are explained in depth and progressively, with many examples in my French audiobook learning method À Moi Paris level 3. The subject is the person or thing that does the action of the verb. There is an easy way to find the subject of a sentence. Then ask: “who + verb” or “what + verb”. The answer to that question will be your subject. Who paints? I paint. “I” is the subject. Who is teaching? Camille is teaching. “Camille” is the subject. Was freedom won easily? What was won? Freedom was won. “Freedom” is the subject. In grammar, a person refers to the different pronouns used to conjugate a verb. I, you, he, she, it, we, they. They are divided between singular and plural (for this concept, read my French blog article on gender and number). The conjugation is the way a subject changes a verb so they match. In English, the conjugation of verbs is quite simple. The verbs don’t change much (I, you, we, they speak – he, she, it speaks) except for the verb to be (I am, you are, he is). It is not so in French, where the verb form changes with almost each different person. The way French verbs are written and their pronunciations are also very different, this is why it’s important to study your French verb conjugations with audio. The same way as in English you will add an “s” to the 3rd person singular (she singS); in French, you will have to change some words or parts of words (like the endings of verbs) to match other words related them. 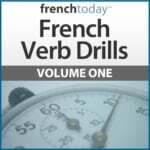 What is a Regular Verb and an Irregular French Verb? Some French verbs are called “regular” because they follow a predictable conjugation pattern (such as adding an “s” to the 3rd person singular in English). Some French verbs are called “irregular” because their conjugation pattern is not predictable (like the verb “to be” in English). What is an Auxiliary Verb in French? An auxiliary verb is a verb used to conjugate another verb. For example: I have washed the dishes. Used this way, the auxiliary verb (have) loses its own meaning (to have = possession), it’s just a way to change the time frame of the action of the main verb (in my example “to wash”). You absolutely need to know their conjugations and pronunciations inside out, not only because you’ll use them all the time as “to have” and “to be”, but also because since they are auxiliary verbs, you’ll use them all the time to conjugate other verbs to build various French tenses. The various past and future tenses of the Indicative mood are explained in depth in my French audiobook learning method À Moi Paris Level 5. What is the Infinitive of a Verb? The infinitive is the form of the verb before it is being conjugated. It’s the basic verb name: “to speak”. In French, there is no “to” before the verb. The infinitive form is shown by the last two or three letters, usually “er”, “ir” or “re” that will also determine the conjugation pattern of the verb if the verb is regular. A tense indicates when the action of the verb is taking place: now, in the past or in the future. A simple tense consists of only one verb form (ie: ‘I speak’). A compound tense consists of one or more auxiliary verb + a main verb (ie: ‘I am speaking’, “I have been thinking’). You need to memorize that in French grammar, the adjective “simple” doesn’t mean “easy” but means “NOT compound” – using only one verb, not an auxiliary + a verb. The mood indicates the position of the subject towards the verb. The mood will affect the conjugation of the verb. Note that there are also impersonal moods in French, which are invariable, meaning they always use the same form, the verb doesn’t change according to who is speaking. The voice (la voix in French) indicates the relationship between the subject and the verb. The subject performs the action of the verb (the active voice, la voix active). This is the most common voice. Je lave le chien = I am washing the dog. The subject performs the action on itself (the pronominal voice, la voix pronominale/reflexive). This voice is very common in French, not so much in English. Je me lave = I am washing (myself). The action is being performed onto the subject – by a third party (the passive voice = la voix passive). Le chien est lavé par le toiletteur = The dog is being washed by the dog groomer. What are Affirmative and Negative Sentences? In French, the regular way to negate a verb is to use “ne + verb + pas”. What are Declarative and Interrogative Sentences? A declarative sentence makes a statement. It is the most common way of speaking. How to ask questions in French and the many French interrogative expressions, as well as interrogative adjectives have been studied in my French Audiobook À Moi Paris Level 3 as well as in Secrets of French Conversation.